A new study from Germany’s Federal Highway Research Institute (BASt) found that the autopilot feature of the Tesla Model S constitutes a “considerable traffic hazard,” according to a report in Der Spiegel. Tesla reports that its vehicles drove more than 130 million miles with Autopilot engaged before one was involved in a fatal crash. Statistically, that beats the safety record for manually driven cars which are involved in a fatal crash every 100 million miles in the U.S., according to data from the Insurance Institute for Highway Safety. We reached out to Tesla Motors for further information. Executives were not immediately available to comment. It’s worth noting that Der Spiegel reports that the study was an internal one, and did not represent a final evaluation. The new report was commissioned after an accident on a German highway late last month. A Tesla Model S with the Autopilot engaged crashed into a bus. Nobody was hurt in the accident, but it did spur the agency to take a closer look at Tesla’s Autopilot. The report cites a number of issues the testers found with Tesla’s systems. Among other things, the car didn’t follow the right road markings in a construction zone — and when there were no road markings, the car simply followed the vehicle in front of it. Another problem the Tesla faced was due to the simple fact that there are still plenty of stretches on the German Autobahn where there are no speed limits. The report says the car’s sensors only look about 40 meters behind it. If the Tesla is going the standard Autobahn speed of 80 miles per hour but somebody is going 125 miles per hour in the left lane (or even faster), that’s not nearly enough. Tesla’s Autopilot feature is billed as driver assistive, not fully autonomous, technology, but the German report notes that the name suggests otherwise. The company recently launched an Autopilot update and is expected to unveil more product news on October 17th. 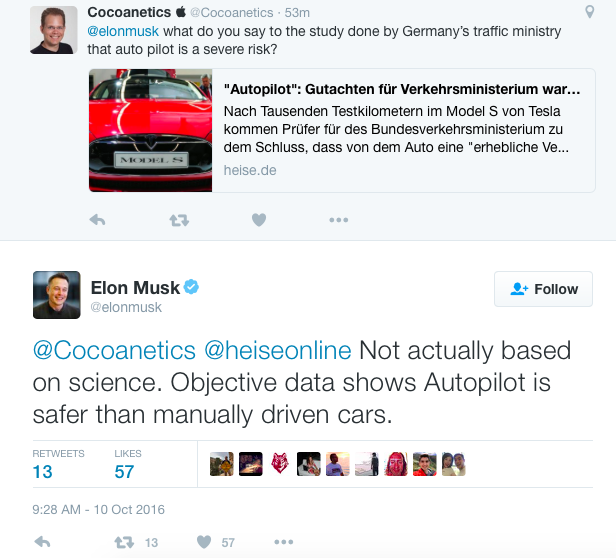 The authors of the German report actually argue that the Model S should be banned from German streets. The Transport Minister, though, is likely to ignore this according to Der Spiegel and instead plans to provide Tesla with a grant to test the Autopilot in Germany. While Musk defended his company’s technology against the German report on Twitter today, he also praised German lawmakers new resolution to ban gasoline and diesel vehicles by 2030.